But there is another feeling that overwhelms me too. Gratitude. Gratitude for this big, messy house and the people who eat food, make dirty laundry and leave their sticky handprints all over it. Gratitude for the little face that appears at my bedside early each morning, often requesting "I just want to snuggle with you, Mom" as he crawls under the covers beside me. Gratitude for my little girl who just wants to crawl, climb, dive, pull herself up on and eat everything in sight. And gratitude for the man who stays at my side through it all. Most of all, I'm grateful that I just get to be part of this wonderful life and family that is mine. During our family night last week, we made a Thankful Tree in preparation for Thanksgiving later this month. It's a pretty simple affair with paper tags shaped like leaves. 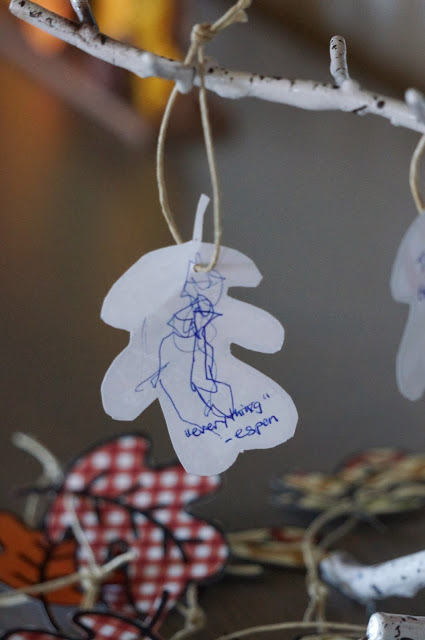 We all write the things we are thankful for on a leaf, and hang them on the tree whenever inspiration strikes. With Thanksgiving just over two weeks away, I'm hoping for a pretty leafy tree by the time we sit down to our holiday meal. I find it a blessing in and of itself to take a few moments to think about the things I am grateful for, the blessings that I have. And it's a wonderful thing to see that process begin to develop in my little three year-old Espen too, to see him think about the things he's grateful for. The other night he got a leaf and a pen and asked for help to write something down. Usually he is grateful for his toys, or his play room or his imaginary friends, so I was surprised and had to blink back a few tears as he told me what to write. Espen's leaf read: "a mom." What more could I possibly ask for? Espen is thankful for "everything". So whether or not Thanksgiving is a holiday that you celebrate, why not take a few moments and think about the things that you are grateful for? 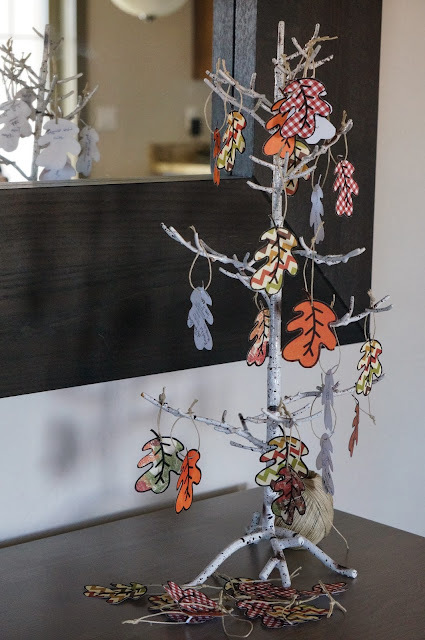 Tell me, what would you put on your Thankful Tree?